Keeping up to the speed the ever changing demands of customers, we are occupied with providing a vast range of Tile Press Machine (RTM-2) to our customers. This bundle of quality is on offer at reasonable rates. We do our utmost to retain the quality we are cherished for. For that purpose, a team of qualified experts is dedicated to match the quality to industrial quality standards to ensure there is no crash in the quality. 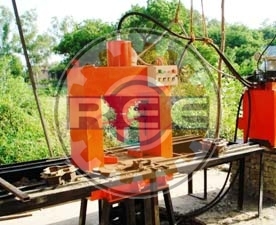 Reva Auto-Tile Press Machine, Model - RTM-2,Powered by 5HP Electric Motor, Production Capacity 2500 to 3000 pavers per shift. PLC Operated. Hydraulic Pressure 2500 to 3000 psi. The Capacity of Hydraulic Oil Tank 250 Ltrs. Automatic Pressing and Manual demoulding of Tiles/Pavers.